Electronic crescendo joined by mechanical whirring and footsteps. The Pennzoil Logo--a yellow oval with "Pennzoil" written in black letters across a red Liberty Bell--zooms forward until it disappears and gives way to video footage. 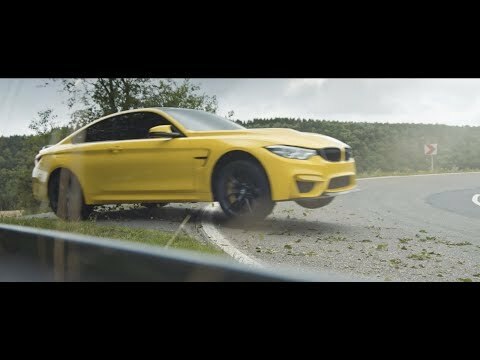 Pennzoil Synthetics Presents: "Escaping the Ring." Silhouetted against a wall of windows, a person pushes an industrial floor sweeper across a vast, empty space occupying an upper floor of a complex. The person stops and checks a phone message. "Last job! Make it out. It's all yours." The person types with a gloved hand. Next, the person holds a card to a reader on the wall, which flashes green. Wearing coveralls over a black hoodie, the person---who appears to be a man-- leaves through frosted glass doors adorned with signs bearing the Pennzoil logo and the words: "Vehicle Research. Synthetics." He tosses the coveralls in a trash bin and heads down a stairwell. Now wearing dark pants and a khaki jacket over the black hoodie, he walks through a parking garage and stops at a vacant spot marked "86." He flips the keychain around to read "98," then later presses the key fob. His hood still pulled over his head, the mysterious person looks to the left. A disclaimer appears in small white letters at the bottom of the screen: "Professional driver on a closed course. Do not attempt. Respect all traffic laws and never drive recklessly." A yellow sports car emerges from the garage and drifts right, leaving a trail of white smoke. Shifting gears, the driver zooms past a complex marked "Nürburgring" in large red letters. The car skids around a track. A sweeping, aerial view of a stone castle on a hilltop overlooking a town nestled in a green landscape of dense woods and rolling hills. A close-up of the speeding sports car reveals a black grill, curved, string-style headlights and a round, blue-and-white "BMW" logo on its hood. Viewed from high above, the car races down a road cutting through densely forested hills. Kicking up smoke, the car drifts around a track. Next, an overhead view of the track as it winds through the forest. In close-up, the car skids around a curve, passing a sign: "Make The Switch: Pennzoil." Now viewed through trees, the car continues speeding down the track. The driver shifts gears as the tachometer passes seven. In slow motion, the car kicks up dirt and grass as its right tires ride on the grassy median. The car rolls back onto the track. Viewed from above, the Pennzoil logo and scattered chalk graffiti adorn the surface of the track. The car drifts around another curve. Passing through a gate, the car skids sideways, knocking over an orange-and-white cone as it enters a country road. Engine briefly drops and a bell tolls. The car speeds through an alley of trees. The engine noise drops briefly, then resumes full force. The car emerges from over a hill strewn with leaves, briefly going airborne in slow motion. A close-up of the tachometer and the driver's hand on the gear shift. Sparks fly when the car lands. A grazing sheep raises its head. The car drifts onto another road, leaving a thick trail of white smoke. The driver shifts gears. Next, a bird's-eye view of the car passing through the wooded landscape. The car careens toward an exit to the Autobahn, then drifts its way around a loop. Next, the car crosses a long bridge spanning a winding river and farmland. The driver rolls down the window. The phone flies out onto the pavement. As the car continues down the road, a message on the shattered phone reads: "Wait! You're not the only one." The Nordschleife–the proving grounds for BMW road cars–is as legendary as the car manufacturer itself. Enter the Nürburgring: the racetrack of all racetracks and the Green Hell of all circuits. 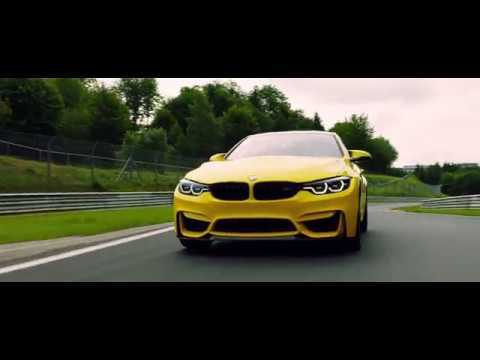 With a lap finish time of just 7 minutes and 38 seconds, the BMW M4 CS proved the Nüburgring’s 73 treacherous turns and 12.9 miles of steep gradients and elevation changes are no match for the competition sports car. The BMW M4 CS comes with an inline six-cylinder M twin turbo power engine, pushing up to 460 hp at 442 lb-ft of torque. This adrenaline-enduring machine relies on high-performance oil and complete protection to tame any track that gets in its way. Pennzoil® PurePlus® Technology delivers engine wear protection to push the BMW M4 CS to reach its full potential and hit the 0-60mph mark in under 4 seconds–because when it’s time to face the Nürburgring, top engine performance matters.